Minor dents and scratches on your vehicle, while not so serious that they can impact your vehicle’s performance, are nevertheless an eyesore that you’ll want to take care of a quickly as possible. Some dents and scratches may require you to seek out an auto body shop, while others can be fixed with simple home remedies. Heat and cold are two powerful allies for do-it-yourself dent repair on a plastic surface. Turning your hair dryer to the highest setting and pointing it at the dent on your vehicle will cause the plastic to expand slightly. Immediately spraying the area with compressed air will then cause the dent to contract, giving it no choice but to take its original shape and pop out. Minor dents on metal surfaces of your vehicle which are pushed in but not overly creased can be popped out with either a specialized car dent plunger or a simple sink plunger (not a full-sized toilet plunger). Just moisten the plunger and the dent itself, and then simply push and pull until the dent pops out. A great solution to getting minor dents out of a plastic bumper is to use boiling water to make the bumper plastic more flexible. Carefully pour the water over your bumper, making sure to stand well back of its stream. If the plastic has softened enough, you will be able to reach behind your bumper and push the dent back out. Dry ice, surprisingly, can be very effective at getting out small dents. By holding the dry ice with protective gloves and rubbing it on the dent, the dent will be forced to cool, contract, and pop out. A shallow scratch which doesn’t go deeper than your vehicle’s surface paint can be easily corrected with touch-up paint. First, you’ll need to clean the scratch, and then you can carefully use a fine sandpaper to remove it. Once the scratch is hardly visible anymore, apply a rubbing compound to the area. Apply several base coats of paint, letting each coat dry between applications. Then, once the basecoat is completely dry, you can apply the clear coat. Home remedies are great for surface scratches and small dents. However, for more extensive damage to your vehicle, you should definitely visit a qualified auto body shop. There are some repairs that just can’t be made at home. At Freeway Auto Body, our collision repair experts will make sure that dents are completely removed, that scratches are seamlessly fixed, and that all paint touch-ups match your vehicle’s color. 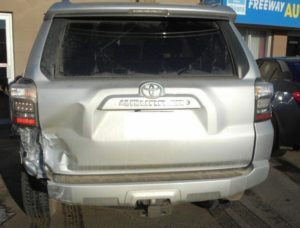 If you’re looking for quality, professional dent repair services in Edmonton, then don’t hesitate to visit Freeway Auto Body today.